The SF-300X is the best-in-class stopped-flow instrument for double-mixing and equilibrium titration experiments: tiny sample volume, sub-millisecond dead time, and configurable observation cells and accessories for high sample-rate absorbance, fluorescence, and anisotropy measurements. The SF-300X Stopped-Flow has a powerful, computer-controlled servo motor drive that provides precise and reproducible mixing. Double mixing experiments can be performed easily while consuming minimal volumes of precious samples and affording a minimal first reaction time of only 5 ms. The motor is digitally controlled with a high torque, low inertia, brushless motor and high performance, digital power supply to provide essentially instantaneous starts and stops of the drive syringes. A significant advance over older stepper motor technology, the servomotor affords repeated or sequential mixing to be performed with precision and ease, completely under software control. Unlike air-drive instruments, the dead time does not depend on the temperature of the solution or age of the syringes. For ease of use and to help in the expulsion of air bubbles, the SF-300X stopped-flow uses a solid vertical drive mount. This arrangement places the sample syringes in a position where they are easy to load and to observe through the transparent water jacket during the course of an experiment. Various sample chambers can be easily interchanged or removed for cleaning and maintenance. 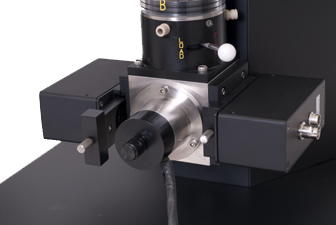 The SF-300X stopped-flow instrument uses interchangeable observation cells. A choice of four observation cells is available, and each can record either absorbance or fluorescence or both simultaneously. An optional CCD array detector allows spectra to be recorded every millisecond for truly outstanding performance. The new SF-300X stopped-flow is capable of producing a dead time of 0.85 milliseconds. With its precision, high torque servo motor drive, the performance of the SF-300X is repeatable and reliable year after year. We use our proprietary microjet mixers to achieve efficient mixing and test reactions have proven that mixing is completed before the sample enters the observation cell. The SF-300X also has excellent performance reliability due to the precision manufacturing of all parts and with proper care will give decades of service. A unique two-position valve is used to allow easy and efficient sample loading. In one position, the three syringes are connected to their individual sample load ports. In the other position, the three syringes can be driven to force the mixing of reactants into the observation cell. Optical sensors read the position of the sample load valve and tell the computer whether the valve is in the proper position for loading or firing. The computer will not fire a shot if the valve is in the wrong position. This safety feature further conserves precious samples. Designed to conserve precious samples, the KinTek SF-300X requires only 20 microliters of each reactant per shot. Moreover, by minimizing the volume of the sample lines connecting the loading ports to the sample syringes, the instrument requires a small load volume. Typically, only 50 microliters of reactant are wasted in loading each syringe. The KinTek SF-300X Stopped-Flow comes with three drive syringes. In the normal mode of operation, only two syringes are connected and used to drive the mixing of two reactants. Alternatively, to perform a double mixing experiment, the third syringe can be connected to the drive path by simply rotating a valve. In a double mixing experiment, two reactants are mixed and then flow into a delay line, the motor then stops for the desired reaction time and then on the next push the solution is mixed with the third reactant and forced into the observation cell. The reaction time is under precise computer control, allowing reactant times as short as 5 milliseconds and up to many minutes. Double mixing experiments allow new experiments to explore reaction mechanisms that cannot be accomplished with other commercially available instruments. The SF-300X can be efficiently and economically equipped to perform fluorescence anisotropy measurements. A second optional PMT is added to the instrument along with an easy to use filter set, and the instrument becomes an optimal anisotropy instrument. KinTek SF-300X is noted for the ease of use and reliability of its software. Running under Microsoft Windows™, the SF-300X operating system utilizes menus to access all of the computer-controlled instrument setup, data collection, analysis and plotting. Data and computer-generated fits are displayed on the display and can be printed on any printer supported by Microsoft Windows™. The SF-300X system software allows data to be easily exported to other programs in ASCII spreadsheet format — at the click of a mouse! Moreover, the data can be exported to the popular KinTek Explorer™ software for rigorous data fitting directly to the model, not to equations! The KinTek SF-300X is entirely under computer control, making the operation of the instrument easy and convenient to use. The computer controls the instrument's drive system, the detector gain and checks to see that the sample load valve is in the right position. It is also programmed to assist in a simple calibration of the instrument. The instrument and software have been integrated into a system that is easy and convenient to use, leaving the operator free to concentrate on the data collection and analysis. KinTek Corporation is constantly upgrading the control computer and A/D converter to afford rapid data collection and analysis. Data fitting is accomplished within the data collection software by nonlinear regression. Data can be fit to one, two or three exponentials or a burst equation. Data can also be fit by computer simulation to the reaction mechanism by global fitting methods using KinTek Global Kinetic Explorer™. Data can also be easily exported for import into the data fitting and graphics presentation program of your choice. Keep in mind that KinTek Corporation is constantly upgrading the computer that controls the stopped-flow instrument. The instrument is shipped with the latest model computer available. Optimal signal-to-noise is provided through several unique advances. A high intensity, stable arc lamp source illuminates the sample using a parabolic mirror and lens-free optics to provide optimal throughput to a monochromator. The optical path is free of lenses, which would limit light throughput. The electronic circuits have been designed to provide the most noise-free amplification possible. An optional programmable shutter may be added to prevent photo-bleaching on experiments with long collection times. Wavelength range: 220 - 800 nm. Spectral bandwidth: : Multiple variable slit widths providing a bandwidth of 4 nm/mm of slit width. Temperature range: 0 - 70° C range of temperature is maintained by circulating water bath (not provided). Dead time: Less than 1 millisecond. Syringe volume & range:2.5 ml standard, 0.25, 0.5, 1.0, and 5.0 also available. The KinTek CCD array is perfect for chemical, biochemical and other applications where fast reactions need to be monitored by changes in absorbance. Capable of recording 2048 wavelength spectra every millisecond, our CCD array spectrometer offers the highest resolution and speed available for Stopped-Flow Absorbance measurements. The CCD Array interfaces with the KinTek Stopped-Flow through optical fibers, one to bring white light into the observation cell and another to connect to the spectrometer. Software for data collection. Analysis of time-resolved spectra by singular value decomposition is accomplished using KinTek Explorer software, allowing multiple experiments to be fit directly to a model simultaneously. The USB2000+ Miniature Fiber Optic Spectrometer is a unique combination of technologies a powerful 2 MHz Analog-to-Digital (A/D) converter, programmable electronics, a 2048-element CCD-Array Detector, and a high-speed USB 2.0 port. This innovative combination produces our fastest spectrometer yet and provides resolution to 0.35 nm (FWHM). The USB2000+ allows users to capture and store a full spectrum into memory every millisecond (that's 1,000 full spectra every second) when the spectrometer is interfaced to a computer via a USB 2.0 port. The USB2000+ is perfect for chemical, biochemical and other applications where fast reactions need to be monitored. Equilibrium titration data are often as important as kinetic data in working to establish a reaction mechanism and can help to decipher stopped-flow signals. The KinTek TMX Titration Module fills the need for an advanced, automated system to titrate reactions at equilibrium. Taking advantage of the smooth drive of the SF-300X servo motor, the TMX unit allows the slow addition of titrant from a 10, 25 or 50 µL syringe into a 200 µL sample that is constantly being stirred. Simultaneously, the system records absorbance or fluorescence (or both, up to 3 channels), to provide a complete titration curve with 1000 points, in less than a minute. The volume of an addition of titrant and time of data collection are fully programmable to cover a range of concentrations and times required for the reaction to come to equilibrium. Equilibrium Titration data can be fitted to a user-defined model without the need to derived equations using KinTek Explorer software. Fluorescence Titration. This figure shows a fluorescence titration of 100 nM enzyme, showing a 20% change in signal. The smooth curve (buried under the points) is the best fit to the quadratic equation with a dissociation constant of 0.25 ± 0.01 µM. The titration required only 200 μL of solution and data collection was completed in 300 seconds. Data can be fitted by nonlinear regression to either a Hyperbolic or a Quadratic equation. Accordingly, the titration can provide both the dissociation constant for the ligand and a measurement of the active site concentration. The system software automatically computes the concentration of titrant and corrects the signal for dilution at the option of the operator. Simply load the sample, attach the syringe containing the titrant, and press “Begin Titration.” Data are displayed immediately and can then be fitted using the system software or exported to a text file for importing into any one of numerous graphics programs. The TMX allows the full functionality of the SF-300X data collection including up to 3 channels of simultaneous data recording. For example, two channels of fluorescence can be recorded to compute fluorescence anisotropy as a function of titrant concentration. The system is simple and easy to use, in keeping with the philosophy that drives KinTek Corporation; namely, to build instruments that encourage researchers to do the right experiments with ease, while providing the highest quality data and rigorous quantification. 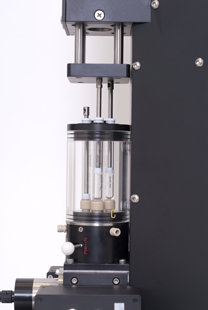 The TMX comes complete with thermostatted cell holder, a 5 × 5 mm cuvette, miniature stir bar and stirring motor drive system. Simply attach it to your SF-300X Stopped-Flow motor drive and begin collecting data! Note: this system will not work with pneumatic stopped-flow systems, as it requires a precision motor drive. Fluorescence Anisotropy Accessory - Consists of a set of polarizers to measure anisotropy in real time. Flash Photolysis Accessory - Enables samples to be mixed and then flashed with a laser or flash lamp.